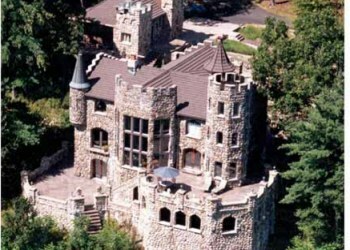 Highlands Castle in the quaint town of Bolton Landing, New York is the perfect location for a romantic honeymoon, anniversary getaway, a quiet relaxing vacation, an intimate family get-together, or to reunite with good friends and associates. Your stay at Highlands Castle will be an experience everyone will be talking about for years to come. You won't find a more peaceful environment to gather, relax, and entertain your friends in a royal setting. You will be a king and queen during your entrie stay at the castle. Upon entering the grand entrance, you will be drawn to the romantic 'Romeo & Juliet' stained glass doors which welcome guests to the well-appointed Great Hall with formal dining room, a uniquely decorated area for special entertaining. The large inviting kitchen features a cozy eating area leading to outside terraces that overlook breathtaking panoramic views of majestic Lake George. There is also a comfortable family room, a relaxing sitting room with library and a convenient downstairs bathroom. 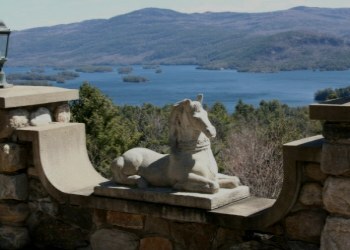 Enjoy the incredible beauty of the Adirondacks from your private balconies. Our outside terraces are the perfect setting for a sunrise breakfast, a memorable lunch or a romantic candlelight dinner to complete a perfect day. 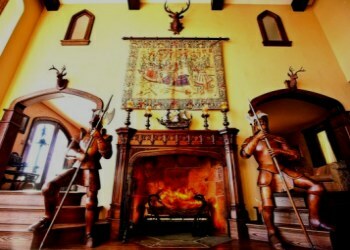 Highlands Castle accommodates a limit of 2 couples. 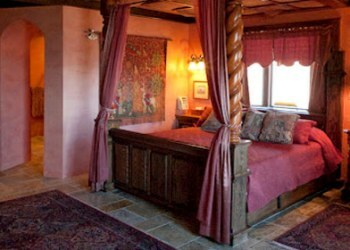 "His Majesty" bedroom features an elegant King Canopy 4-poster bed and private bath. "Her Highness" bedroom includes a queen bed and private bath.